This masterpiece of Indian Literature contains the most widely known stories in the world. In fact, it is universally acknowledged as the best collection of stories known to civilized man. It is presented in an artistic form of wise and witty stories that has never failed to bring delight to millions of people. Taken as a whole, Ryder's work as a translator is probably the finest ever accomplished by an American. It is also probably the finest body of translation from the Sanskrit ever accomplished by one man, if translation be regarded as a branch of literary art, not merely as a faithful rendering of the meaning of the original text. I would like to begin my thoughts with a disclaimer. I am a die-hard fan of Panchatanta and I have grown up reading these stories. These stories are a part of my childhood and who doesn’t like to revisit them?! First things first. The cover-page is simple and very Indian. 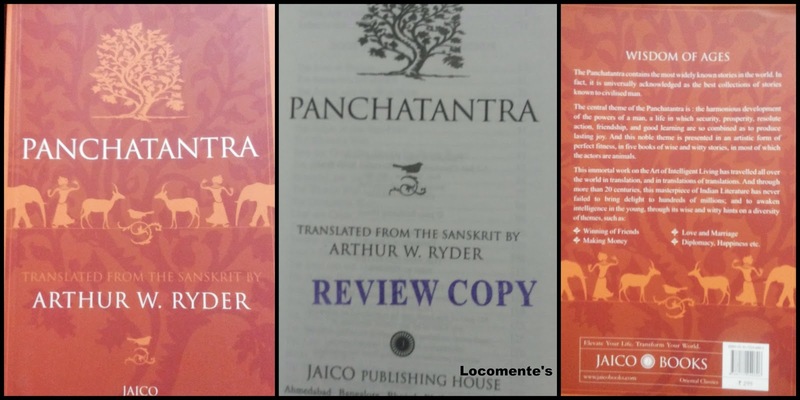 The book blurb gives a background of Panchatantra. Panchatantra means five books in Sanskrit and needless to say, this book is divided into five sections. For those who don’t know about Panchatantra, it is a collection of short stories written by Vishnu Sharma in Sanskrit. It conveys the important lessons on righteous life. This is not conveyed through preaching. But, through the small stories. Most of the characters are animals and birds. Each story has a moral which is relevant to mankind. The beauty of this book is that it will never lose its charm. This is still relevant and will be so forever! The author has wonderfully translated the stories. The poems in the middle of stories are very beautiful; often rhyming. The book is more like a work of literature. More so because this is a translation and not retelling. So many a times, the narrative becomes too tedious and boring. The poems in between, in spite of the beautiful language, becomes an overdose. ii. And a story that can be retold and never loses its charm!